This handy accessory for the AscorLight QC-4 provides a fool-proof audible and visual misfire alarm. The alarm is also triggered if the picture is taken before the 100% ready light is on. The circuitry is automatic regardless of the number of lights used. If the alarm sounds, you simply cancel by pushing the Reset button. The unit plugs into the Fail to Flash outlet on the front panel of the power supply. 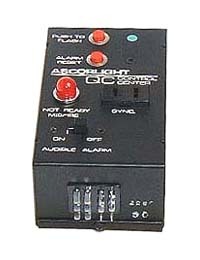 Note: The QC Control Center is compatible only with the QC-4 system and cannot be used with other AscorLight systems.